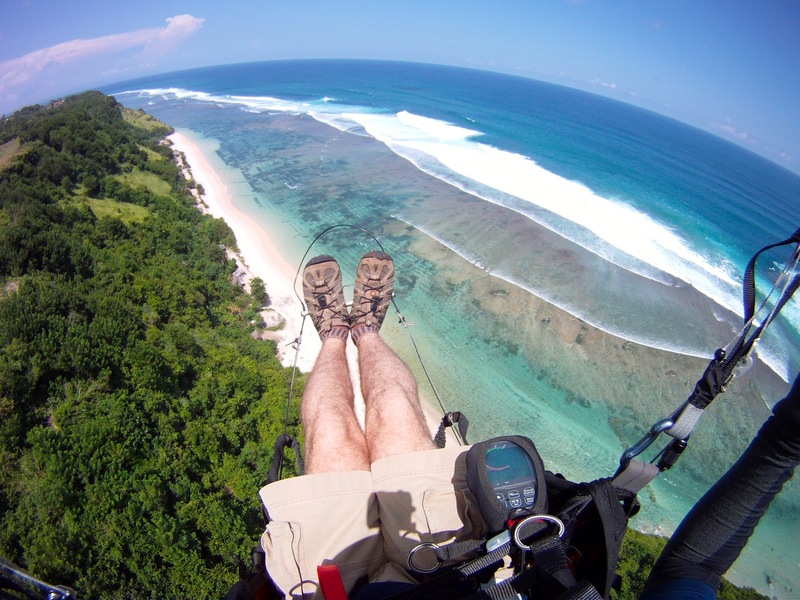 Experience a tandem paragliding flight at the Bukit Peninsula, south Bali. Watch the sunset from a comfortable seat above the ground. Go back home with your head full of great memories. Free hotel pick up in Nusa Dua and Jimbaran areas (minimum 2 persons, 200,000 IDR extra if only 1 person). If the idea of watching the sunset from a comfortable seat above the ground, supported by the buoyant evening air, with perhaps a bird of prey joining you off your wing tip sounds appealing, then a tandem paraglider flight is for you. Join us for a flight from Timbis or Gunung Payung on the Bukit Peninsula and soar high above the rugged southern coastline of Bali with one of our tandem pilots. Each flight is up to 20 minutes (weather permitting), preceded by a short instructional briefing. Our professional team of safety conscious pilots and instructors have thousands of hours of flying experience and the flight safety officer lives onsite at Timbis. He knows the local conditions better than anyone!. All paragliding equipment supplied. To bring with you for the flight: Running & sport shoes (no flip flop). Maximum weight for the paragliding is 115 KG. There is no minimum weight.